Dry macular degeneration was detected in March 2007 in my right eye only. While the right eye was still dry, wet macular degeneration was detected in my left eye in February 2008. My first Lucentis injection was in March 2008 for wet AMD in my left eye. Wet AMD was then detected in my right eye in July 2008. The vision in my left eye was 20/60 and my right eye was 20/200. After a year or so of monthly injections we went to every other month and then every 3 months. The period before my last injection (both eyes) was 4 months. As of October 2011 I have received 22 injections in my left eye and 15 in my right. The vision is stable at 20/80 in my left eye and 20/200 in my right eye. No further bleeding has occurred for more than a year. My doctor suggests that I should decide whether to continue getting shots regularly, with their attendant risks, or wait and see what develops. There is evidently insufficient data on patients taking Lucentis over this long a time period to allow him to recommend one option over the other. It is very difficult for me to make such an important decision based on nothing better than a coin flip. My present level of vision is adequate, using visual aids for macular degeneration, for such activities as reading and computer work. I would hate to jeopardize it. There are risks both ways. If any readers have experience with pausing Lucentis injections after a period of vision stability I would appreciate hearing from you. I just started with Macular shots early 2019. Sounds like I will be doing this the rest of my life. Age 77. Your post sounds very discouraging. The shots have never hurt me. When I go see Dr this month, it will be a new Dr, hopefully he will be great. My email; eamims47@gmail.com, if you have any encouragement or not. After 7 years of my eye being stable, my exam last week showed leaking. I knew something was up as I could see my vision slightly changing. I was not prepared for the injection which I received on that visit last week. I was told it was painless. After the nurse swabbed my eye 4 times with a thick coating, then cleaned the area, the Dr came in and injected my left eye. I almost jumped out of the chair. It was so painful!!! I felt the needle and the liquid go into my eye. Has anyone else experienced this kind of pain with injections? I have to go back every 28 days due more until Dr decides the outcome. I'm already dreading my next appointment. I don't think enough time was allowed for my eye to get numb. The whole experience was awful. Finally (!) I have found others with patterns similar to mine. TADA! I have had 30+ Lucentis injections in my left eye (now 20/30 and holding) and 10 in my right eye (20/200). I am still getting injections in both eyes, but I expect treatment in the right eye will stop after this current monthly series, since it has not responded. My retinologist, Joan Miller, MD, at the Mass. Eye & Ear Infirmary, has given me "breathers" in the past--a month or two off when my left eye looked reasonably OK. But, as I understand it, with wet AMD fluid will continue to gather from time to time, necessitating follow-up, so that this is a life-long treatment. While my left eye was never treated, we share the same time frame. If you find out anything further, I'd appreciate hearing from you. Facebook is a good place to find me as Barry Fivecoat in Phoenix. My first injection was in January of 2008. I've had approximately 30 injections. Let me know, won't you? Join in and write your own page! It's easy to do. How? 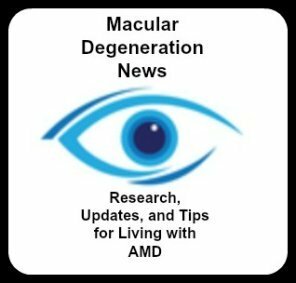 Simply click here to return to Macular Degeneration Prognosis. A yogic "trick" that helps me during Eyelea injections. I spent my 69th birthday getting "poked in the eye with a sharp stick"...when I got my 1st injection (Avastin, then...now Eyelea). Needless to say, I was in "sticker shock" on that 1st occasion...although the idea was scary, I was curious & thought I was fairly calm & accepting of the whole procedure, but my BP reading post-injection said otherwise! I knew I needed to find a way to remain calm during subsequent trips to the retina specialist. Although I do not practice meditation or yoga at this time (I have, in the past) I stumbled upon a technique that has helped me quite a bit. 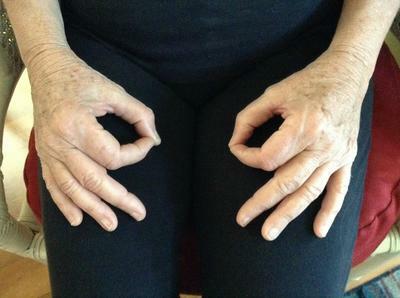 It is called a "mudra" or yogic hand/finger position, of which there are many. The particular one that seems to help me is called "Gyan Mudra" & is described as "a tranquilizer to promote mental peace & dissipate tension." It is very simple to do & I hold both hands in this position during the time I am in the room, being prepped & receiving the (now, every 2 months with Eyelea) injection, approx. 20 minutes in all. I touch my index finger to the fleshy pad of my thumb, holding lightly with no real pressure. My other fingers are semi-extended in a comfortable manner (see photo). Once the prep work is done, I close my eyes & wait for the doctor to come in & administer the medicine. I am not fond of the speculum (what woman ever likes that sort of device! ), but it is tolerable since it isn't in position for more than a minute or so. And I honestly think the "mudra" helps to keep me calm during the whole experience. My BP is normal & I feel a sense of calmness in spite of what is going on during the injection & afterward. Although the staff at my retina specialist's office do a thorough job of numbing & sterilizing my eye in preparation (yes, the betadine solution sure does sting), there is an almost immediate ache after the injection. I choose to have my injections late in the afternoon or early evening so I can go home & go to bed, wearing the eye patch the doctor's office puts on after the injection. Usually, by the next morning, the aching is gone, thank goodness, & I can resume my normal activities. I was diagnosed with dry AMD approx. 10 years ago, but did not fully grasp the seriousness of my situation. Due to a change in my medical insurance, I switched to a different doctor & he eventually did cataract surgery on both eyes. He never mentioned AMD & I forgot that I even had it. Approximately 2 years after the cataract surgery, my right eye went "wet". My left eye is still stable & now I take ARED-type supplements (as well as many others recommended by my primary care doc) & have upgraded my diet to a much more supportive level, i.e. lots of greens, few carbs/sugar, etc. So far, my vision is 20/25 in my right eye (the one affected by wet AMD) & still 20/20 in my left eye. Thank-you Mary for taking the time to share your relaxation technique with us - I hope it helps many others as they prepare for their regular eye injections. Comments for A yogic "trick" that helps me during Eyelea injections. I Hope It Helps Your Mom & You. Ruthie, thank you for taking the time to write your message...it means a lot to me to know that I might be able to help someone else with a difficult situation. No one likes pain/needles/injections/you-name-it, and finding coping mechanisms can be nearly life altering. Best wishes to you & your mother....so glad to hear about someone who was getting the injections being able to stop. Hope it continues! This morning I had my 3rd injection in my left eye. I was dreading it because with the last 2 I had horrible pain in the afternoon and evening. Today he said there might be something on my cornea that is causing the pain. So he put a contact lens in the left eye. I am still having some pain but no where near where it was after the last 2 shots. I have only had one in the right eye and no pain afterwards at all. I go back Monday to have the contact taken out. I hope I don't do something in my sleep with the contact. I couldn't believe he told me to not take it out even for bed. So I am only seeing with the right eye tonight. They did check my vision and both eyes have improved. I am so hoping that after this, I won't need any more Avastin injections. I’m sorry to hear about the pain you are having after your eye injections. How did you last eye appointment go? Did you doctor recommend more injections or can you take a break? Has anyone just stopped taking eye injections? My mother in law is 93 years old and has been taking these painful injections for at least 5 years. She cries the whole half an hour from her home to the clinic but is afraid of going blind if she doesn't keep taking them. The cost is outrageous and she gets sick with anxiety before going. Does anyone know how long after she quits that she might lose her vision? I just can't believe all she has gone through with no end in sight. I have had 3 injections in the right eye. Jan,Feb. March of 2013. The eye improved to the RATE the Dr. said "IT IS GONE". However I go back this Aug.24th for exam to see if it needs another shot. I fear the left eye might have changed to wet AMD. Not sure. I seem to have EXCELLENT VISION. I have NEVER had any SIDE Effects AT ALL. No Pain. Last time did not even need to use any drops. I Take OIL from WILD CAUGHT SALMON now. Never did take any FISH OIL. COULD NOT TOLERATE IT. ALSO found on the iternet that BLACK RICE, itself & BLACK RICE EXTRACT are very good. I take both as well as Organic Black Currants & Black Currant extract. The Vitamins Advised plus ASTAXANATHIN, Shark Liver Oil, called SQUALAMAX,a product being tested for macular degeneration. You can find all of these on Internet. Look for Nu-Gen Nutrition, also SWANSON VITAMINS for Currant Extract & Black Rice. I get my BlackRice from OUTPOST HEALTH FOODS IN The BULK DEPT. I hope all of this will help. Will see on Sat. Also I eat a LOT OF ORGANIC KALE. At age 69 I was diagnosed with wet ARMD in the right eye. Had clear vision but very distorted in the vertical plane. Went through two years of monthly Lucentis injections with results being that the condition did not get worse or better. Got a change of doctors and the new guy gave me a steroid injection. I now see only a very small sliver of very poor vision at the extreme right periphery because the steroid weakened my immune system and a Zoster virus activated in that eye. Be very wary of getting a steroid injection in your eye if you had Chicken Pox as a child. I don't have to go back until the end of November. He will check and see if I need more injections then. I am hoping I won't need any more. He did tell me to call the office before then if I have problems. This site is wonderful. I sent it to my children so they can see what I am dealing with. Right now things are good and I am so thankful the Avastin is working.